Mobile and online apps, seeking to inform or influence voters, have been more active than ever before in this election. Rallies, rhetoric and debates continue to make noise on prime time TV this election season. But this time, the online world too is buzzing with election-related content like never before. And along with the chatter on social media networks such as Twitter and Google, there are a host of innovative apps. One such is Kaun Banega PM?, developed by Gurgaon-based Ideafarms, which boasts 2,500-plus downloads since its launch on March 14 this year. It gets gamers to predict India's next prime minister. "Everybody is looking at something that is very topical to get attention," says Rajiv Malhotra, Executive Director, Ideafarms, who developed the game for the makers of Yeh Hai Bakrapur, a Bollywood film slated for release in May. "The links to the movie trailors are embedded within the game as a promotional strategy." 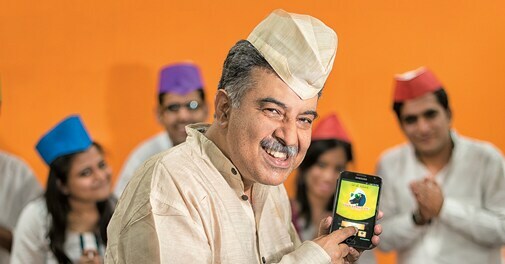 Another game to choose the next PM is Be a Millionaire, launched by Kolkata-based Foreseegame in January. Here, the ones who get it right will win Rs 10 lakh. The game has already attracted 50,000 players. "The entire process is monitored and vetted by leading audit and legal firms in India. We have a 100-strong team of professionals managing the entire platform," says Saurabh Newatia, Assistant Vice President, Marketing and Strategy, Foreseegame. He hopes to get at least 500,000 hits by the last day of polling. Apps are a new communication tool for politicians who are interested in communicating with peopled"
"Apps are a new communication tool for politicians who are interested in communicating with people," says Dilip Vamanan, Co-Founder and Director, Bullfinch Software. 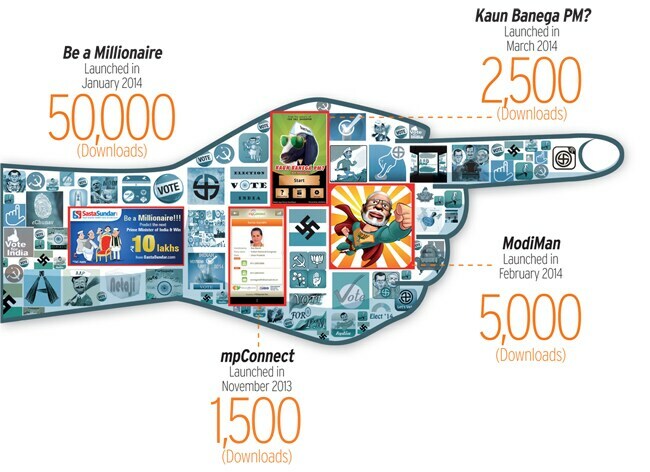 The start-up launched India Election 2014 Candidates, an election-focused app, on March 21, which has garnered about 1,000 downloads so far. The idea struck Vamanan in February this year after his company was approached by two MLAs - one each from the Congress and the BJP - to develop mobile apps that would help them connect with the voters in their respective constituencies. India Election 2014 Candidates allows users to log in with their Facebook accounts and find the names and profiles of electoral candidates across all 543 Lok Sabha constituencies, besides historical data, such as who won from each seat in past elections. "People don't even know who their local MLA is. The information is available but is spread across the websites of different political parties and the election commission," says Vamanan. Mumbai-based iForIndia allows users to register with their mobile numbers and rate their MPs, MLAs and chief ministers' performance on parameters such as quality of basic utilities - water, transport and electricity - infrastructure, governance, jobs and women's safety. All the points accumulate to assign a report card to the candidate. Launched in August 2013, iForIndia has generated report cards for 98 per cent of the 543 parliamentary constituencies, 73 per cent of the of the assembly constituencies (about 4,200 MLAs) and for CMs of all states and union territories. "To get more people on board, we are advertising on Facebook, which has a huge mobile audience across the country," says iForIndia's Founder Ankur Garg, who quit his job at Microsoft in September 2012 to set up the platform. The company also has plans to launch a mobile app version. Founded by Vikram Nalagampalli in August 2013, Bangalore-based Voterite Software works as a social network that, among other things, allows voters to campaign for candidates of their choice among their friends on social media sites. The platform, which was used by Arvind Kejriwal's Aam Aadmi Party (AAP) for the Delhi elections last year, currently has about 30,000 registered users and is working with 60 candidates, creating their profile pages supported with videos and campaign slogans. Last July, when Deepa Kumar, 23, a Political Science graduate from Mumbai's St. Xavier's College, spoke to politicians about organising Twitter chats or Google Hangouts to reach out to tech-savvy online voters, they gave her the cold shoulder. Things, however, are different now. "Everyone wants to woo voters online," says Kumar, Founder and Director of Mumbai-based GrassRoute India. Since it took off in June last year, GrassRoute has set up nine Twitter chats and six Google Hangouts for 10 politicians, including Milind Deora of Congress, Somnath Bharti of AAP and Jayaprakash Narayan of Lok Satta. The level of engagement in these sessions depends on the topic. For a one-hour chat with Rajya Sabha MP Rajeev Chandrasekhar on Youth participation and governance issues in politics, tweets reached 8.8 million people, and for the one on How corrupt is our sports administration with AAP's Rahul Mehra, they touched 1.25 million. Grass-Route also markets mpConnect, an Android and iOS mobile application, which allows users access to contact details of MPs or MLAs and connect with them right from the app. With almost 37 per cent of the 200 million online citizens eligible to vote, Sandeep Menon, Director, Marketing, Google India, says that his company is trying to keep Indians informed about the political scenario in the country, keep them engaged and, most important, inspire them to vote. "Outside of the US, this is Google's most comprehensive initiative around elections," says Menon on Google's Pledge to Vote campaign launched on March 24. Anyone who visits Google.co.in/elections will come across a host of tools such as the Pledge To Vote, which not only enables people to express their pledge to vote, but also lets them view why citizens across the country are doing the same. While some citizens have pledged to vote for a corruption-free India, others have pledged to do so for a safe and peaceful country. There is also a Google Score tool which gives daily information on the most talked about politician, whose video interviews have been most watched on YouTube and so on. As of March 31, Google Score showed that BJP's prime ministerial candidate Narendra Modi was the most searched politician followed by AAP's Kejriwal. Meanwhile, Rishi Jaitly, India Market Director, Twitter, claims that there has been a 600 per cent increase in the level of political conversations in India on Twitter in the last one year. "There has been a 10x increase in political parties and candidates on Twitter. There are a billion tweets on Twitter every two days about the polls," he says. Twitter offers promoted tweets as well as accounts which are being actively used by political parties and candidates to amplify their message. In fact, it also has a designated official in Delhi whose job is just to help political parties reach out to voters through Twitter. Apart from political parties, Twitter has also been actively working with a business newspaper and news channels for election coverage. "? The growing role of Twitter in elections was also seen in the state elections held in Delhi and elsewhere earlier," says Jaitly. While the politicians are excited about connecting with people now, the enthusiasm may taper off after the elections. Some intend to use apps to ensure this does not happen. "My mandate starts after the elections when we will get MPs to connect with people on the handling of the affairs of their constituencies and making them accountable," says GrassRoute India's Kumar, In the next few months, she wants to add details on the performance of MPs in Parliament to the app - how they participated in debates, which parliamentary standing committees they are part of, etc. Garg of iForIndia, on the other hand, plans to monetise his platform by partnering with a TV channel to develop a programme around the content.